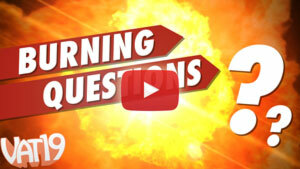 Cricket Prank: Covert cricket noisemaker will drive your loved ones crazy! 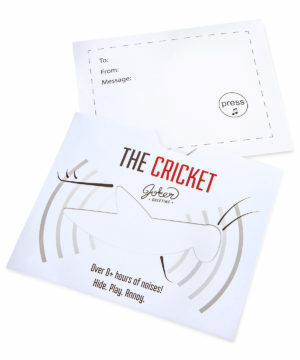 Whether you want someone to seek out your words of affection or just want to get on somebody's nerves, hiding a Cricket Prank noise card is a great way to send them on a frustrating scavenger hunt. This postcard not only makes an intermittent cricket chirp that will drive a frenemy mad, but also gives you space to write your “gotcha!” message! Use the reverse side's adhesive strip to hide the Cricket Prank in an inconspicuous hiding spot and watch your friend drive themselves up (and possibly potentially punch) the wall in frustration trying to find it. Even after they've located the source of the chirp, they won't be able to turn it off until the battery runs out… if they try to prematurely silence the irritating insect sound, they'll be glitter bombed!